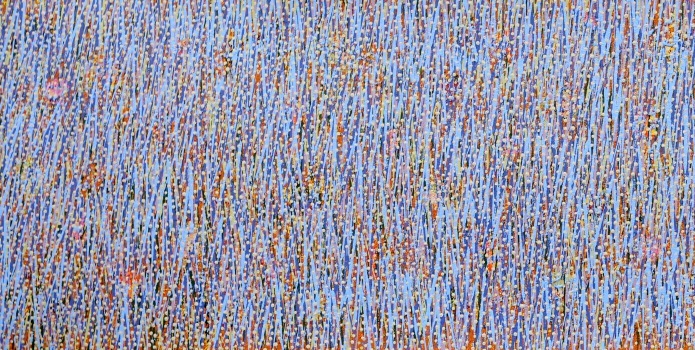 Many paintings in Aboriginal art depict the creation stories of the artists’ ancestral lands. Depending on where these come from, these paintings reflect the mutli-layered stories and sand drawings that were a part of ceremonial life and are depicted from an aerial perspective, showing, among other things, a map of sacred sites relevant to the creation story. 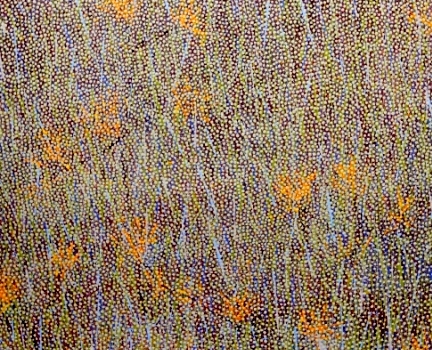 In the Pilbara region of Western Australia, Yindjibarndi artist Marlene Harold, depicts the creation story for her people in a Western landscape format. While most of the Yindjibarndi people now live close to the coast in the town of Roebourne, the Yindjibarndi people are the traditional owners of a large part of the central Pilbara stretching from the Millstream-Chichester National Park south across the Fortescue River into the Hamersley Ranges. According to Yindjibarndi law, in the beginning the sky was very low. When the creation spirits, the Marrga, arose from the ground they raised the sky and the world out of the ocean. The Marrga gave names and form to the country and then to all the birds and animals. Finally they created the Ngaardangarli, the Aboriginal people. This creation story is called Ngurru Nyujunnggama – When the World was Soft. In the early morning, the mist seen rising over the water is the smoke from the Marrga’s breakfast fires. Painting in her distinctive delicate style, Marlene Harold commemorates and celebrates this ancestral creation story of her people, which she titles In the Beginning When the World was Soft.